Saturday dawned beautiful and balmy. I dressed in a swimsuit with shorts over and was prepared for a great race day. The winds were not too bad but they built as the morning progressed. 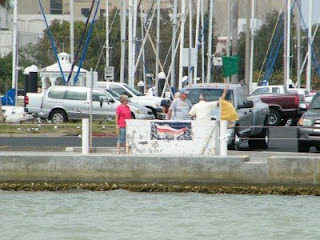 Bruce and I met Mark and Brenda at their boat, Sea Flight and we all went out to breakfast. 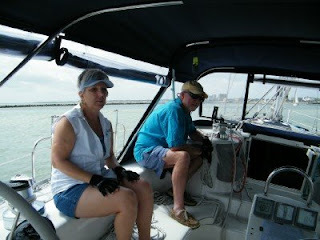 Afterwards, Brenda and I cleaned the dust from the recent west winds off of the boat and got things ready while the guys attended the skipper's meeting. The race began at noon. It was a "persuit" start which means that we are using our handycap at the start so that when we finish, we all know how we did. The winners are first, second, and third over the line. I really think that way is the best way. Our crew was rounded out by a 5th, Johnny. I've never sailed with him before but he was very pleasant. 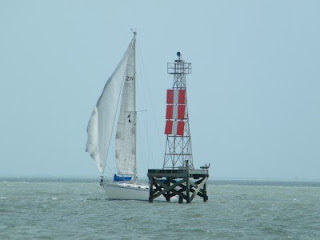 Our old friend Karl was aboard Brigadoon. It was good to see him back out on the bay. Jan wasn't racing.. word has it that her back is still giving her a bit of trouble. Sorry to hear it. It was a funny thing seeing them here. On our way to the boat in the morning, we passed a woman walking along Mcardle that I would have sworn was Jan. It turned out that it was her, on her way back to her mom's place at our neighboring townhomes, Rock Creek. See! I wasn't crazy! Anyway... we had a great start. 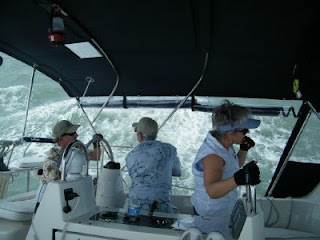 The winds were up over 20 kts. We had a smaller gib... the "giblet"... as Mark calls it, but a full main. This we kept slacked off for the majority of the race to depower it. 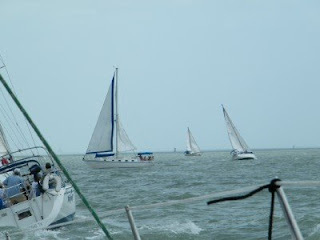 As we were creeping up on the boats in front of us at the first mark, we saw Still Dreaming round it and then stall and begin to drift back onto the mark. Yikes! From our vantage point, it seemed like there was no way that they would make it. Somehow they slipped right by it and had to fall way off to regroup. 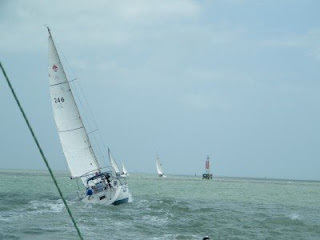 It looks like there were lots of differing opinions about how to round this mark today. The rest of the race was nice and uneventful. We rounded the other marks and maintained third place. Our crew worked well together. 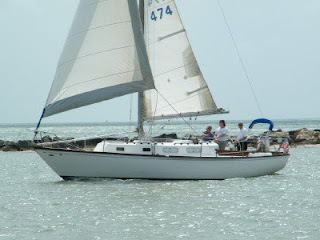 Mark's boat is very easy to sail and always a pleasure. It was a great day!